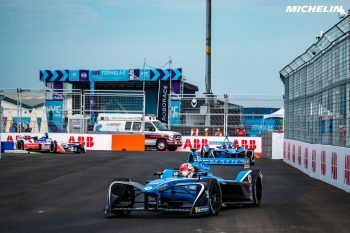 The ABB FIA Formula E Championship fourth season draws to its conclusion for 2018 this weekend. 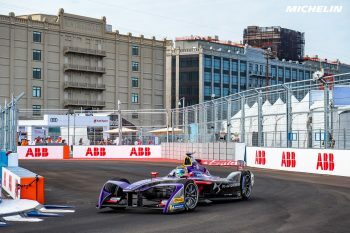 Saturday morning’s qualifying provided a stunning set-up of today’s first of two New York City E-Prix races. Championship rivals Jean-Eric Vergne of Techeetah and Sam Bird and DS Virgin Racing appeared to have polar opposite qualifying sessions. However, a significant ruling from the stewards changed the outcome and built further drama for today’s race. Vergne led his first group session, while Bird was only fourth of five in that same group, and immediately in danger of getting knocked out of Super Pole contention. However, after Group 3 of 4 in first qualifying, Vergne and Techeetah teammate Andre Lotterer got all their times deleted. Vergne was the first car under investigation for exceeding max power usage of 200 kW, and before Group 4, was sent to the back. Techeetah’s Mark Preston explained the situation to FIA Formula E reporter Amanda Busick following the time deletion. Provisionally, Bird will start 14th and Vergne 20th and last for today’s Round 11. Vergne may move forward one spot if NIO’s Oliver Turvey, who failed to qualify due to a wrist injury, does not start the race. Bird enters this weekend 23 points behind Vergne with two races remaining. Today’s Round 11 airs live at 3 p.m. ET on FOX. 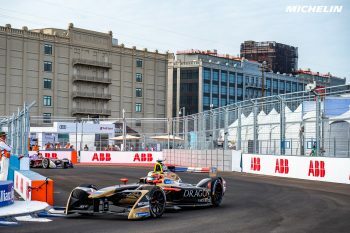 Following the penalties to the Techeetah teammates, Daniel Abt, Mitch Evans, Jerome d’Ambrosio, Sebastien Buemi and Nico Prost were promoted into the Super Pole session. In the Super Pole, Prost posted the first time at 1:14.921. Renault e.dams teammate Buemi went quicker by a full second, at 1:13.911. Dragon’s d’Ambrosio posted a scrappy 1:15.391 lap, that had a couple lock-ups. Evans, in search of his second straight pole, was several tenths adrift as his lap pressed on. The Australian went to second, but still some 0.554 of a second in arrears of Buemi. Abt was last up to see if he could supplant Buemi atop the charts. Once he locked up at Turn 6, it was over, and Buemi took the Super Pole. Buemi missed this race last year owing to his FIA World Endurance Championship commitments with Toyota, and Pierre Gasly filled in for him. Now he has his second pole of the season, first since Marrakesh. It’ll be Buemi, Evans, Prost, d’Ambrosio and Abt the top five on the grid. The action will be further own the order as Bird and Vergne attempt to carve their way forward.